The original galley kitchens were installed on ships and trains where limited space demanded compact, highly efficient meal preparation design. They featured parallel runs of cabinets with a work corridor between them, a setup that was adopted by restaurants and dwellings alike. While the arrangement remains a favorite of many professional chefs, homeowners are split—people tend to either love or loathe a galley kitchen. Perhaps you’re planning a remodel or a new home and wondering if a galley kitchen would work well for you. Or, maybe you already have a galley kitchen and are hoping to make it function better. Whatever spurs your interest, read on to gain an understanding of this distinctive cook space, plus design and organization tips that will help you get the most from a galley kitchen. Until the 1930s, galley kitchens were common in many homes, usually located at the back of the house—far removed from entertaining and dining areas. They were purely functional with no extra room for guests to chat with the cook. 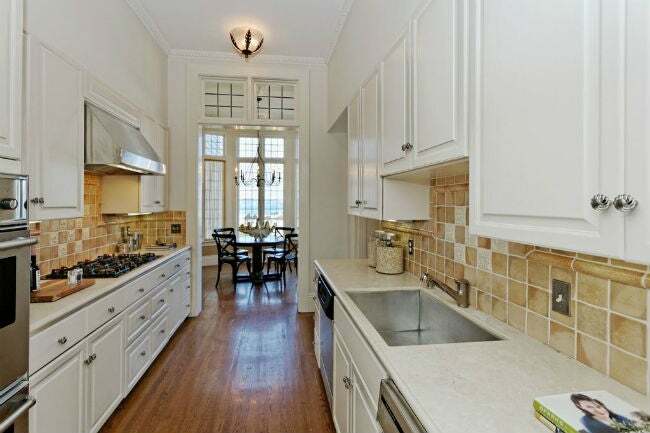 Larger kitchens became the norm in the ‘40s and ‘50s, and the galley was all but forgotten. Then, at the turn of the 21st Century, serious home cooks began clamoring for an all-business place for meal prep again. Today’s galley kitchens are designed for both functionality and style; they aren’t as small or dark as their forebears and are fitted with the latest appliances and storage options. Depending on your lifestyle, cooking preferences, and square footage, a galley kitchen might be perfect for you. 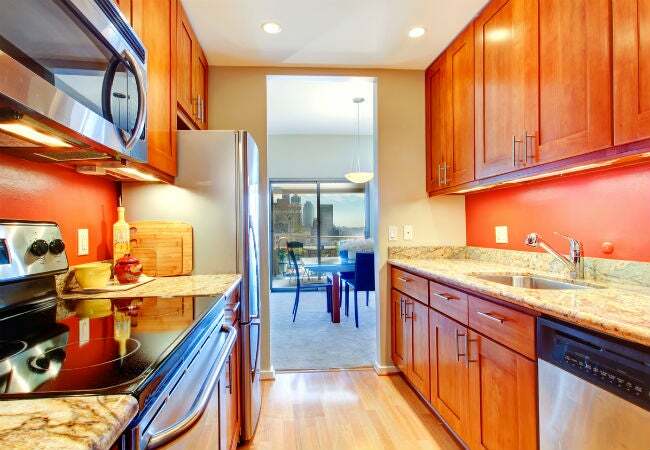 + Good layout for serious cooks because it puts all appliances and kitchen tools within a short distance. + Efficient space utilization for small homes due to its narrow footprint. + Kitchen isn’t on display from living areas—a plus for messy cooks! – Not conducive to social interaction—limited space for people to gather during meal preparation. – Corridor galley kitchens that open at both ends can become a thoroughfare for other family members during meal preparation. – Not sufficient room for multiple cooks who might find themselves in each other’s way. 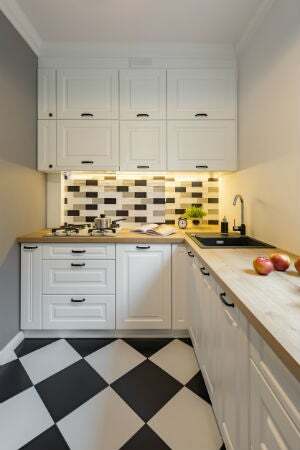 Whether you’d like to turn your cook space into a galley or open up an existing galley for a more spacious environment, keep in mind that kitchen remodeling is a pricey proposition. Replumbing to move water supply and drain lines, rewiring an existing electrical system for new appliances, and the possibility of removing load-bearing walls—all projects that must be done by licensed pros—make for an expensive venture. While the final cost will depend on size and scope, expect to pay an average of $17,000 to $21,000. Consider the following before you embark on a kitchen remodeling project. • Obtain work estimates from several contractors, plumbers, and electricians during the initial design phase. While virtually any kitchen design can be accomplished, the cost will vary greatly depending on the complexities of rerouting pipes and wiring of the existing mechanical layout. • Removing one side of an existing galley kitchen may require taking down a load-bearing wall. If this is the case, the contractor will need to install a large structural beam to take the place of the wall, which can be either visible or tucked above the ceiling drywall; either prospect can be expensive—a few thousand dollars minimum. 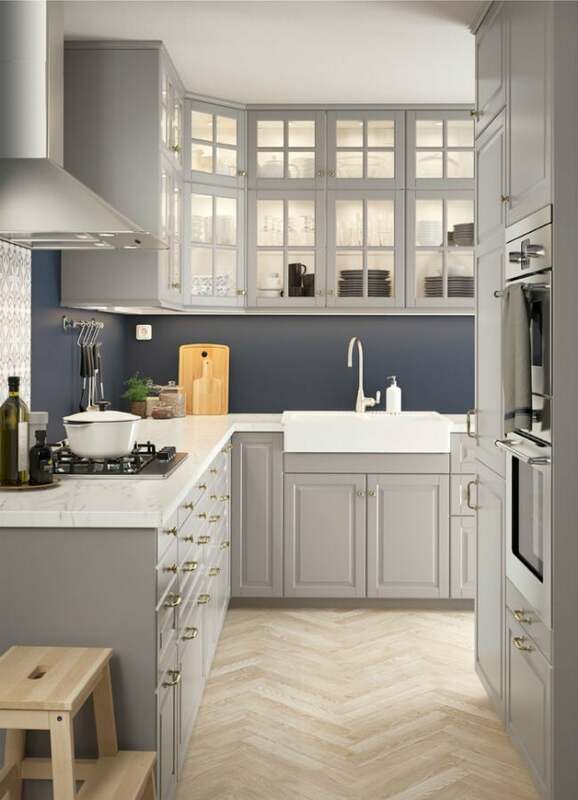 • If an airier look is your goal, it may be simpler and more cost-effective to remove only the top cabinets of a galley kitchen, leaving the lower cabinets in place. This creates openness while retaining under-cabinet storage, and can save thousands of dollars over a full cabinet-run removal. The compact and narrow nature of a galley kitchen presents some challenges, which can be overcome by good design and an eye for organization. Consider the following before building or upgrading a galley kitchen. • Add light to a galley kitchen, by either installing a window or a skylight or by adding bright ceiling and task lighting, will illuminate work areas and make the kitchen more inviting. • Choose light colors, as bold and dark hues can make a galley kitchen feel even narrower. Light shades on cabinets, painted walls, and other surfaces will make the kitchen feel larger. • Incorporate reflection—with, for example, stainless steel appliances and glossy tile backsplashes—to create the illusion of a bigger kitchen. • Optimize storage and do away with clutter. Use pegboards and hooks or hanging pot racks for cookware to free up room in drawers. Utilize the space above upper cabinets to store seldom-used items such as holiday serving platters. • Galley kitchens are already compact so creating an efficient workspace is key. Consider designating one side of the kitchen for appliances, such as the fridge and the range (or cooktop and built-in oven) and leave the other side for the sink and workspace. This layout will allow two cooks to work in the galley kitchen without being constantly in one another’s way. • If you have a U-shaped galley (blocked off at one end), consider locating the sink at the end. This will let you transfer dirty pans and bowls to the sink as you prepare meals, freeing up countertops for work. • When designing a new galley kitchen, plan to keep the cabinet runs four to five feet apart for optimal meal preparation. A bare minimum distance between the fronts of the cabinets is three feet, which will allow for opening the oven and cabinet doors and for moving between appliances, but the space will surely feel cramped. More than five feet between runs and you’ll be spending much time in transit, walking back and forth. • Plan for a minimum of 12-foot cabinet runs if possible to give your galley kitchen sufficient room for appliances, storage, and adequate workspace. • Add open shelving in the upper cabinet runs. This helps a galley kitchen look a little wider, and you can position canisters, mixing bowls, and other cooking items within easy reach. • Keep countertops clear to avoid clutter, opting for built-ins whenever possible. A microwave installed above the cooktop is a smarter use of space than a microwave sitting on the countertop. • If you have an open-space kitchen, you can create the feel of a galley by installing an island parallel to an existing cabinet that runs along a wall. This is a great way to gain additional countertop area as well as welcome storage in the lower part of the island.